No matter what the industry is. No matter, if big or small. 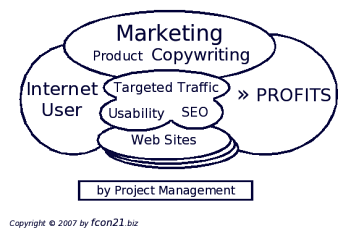 The most important factor for building a business is good Marketing. This is not different and probably even more important for any internet based business. 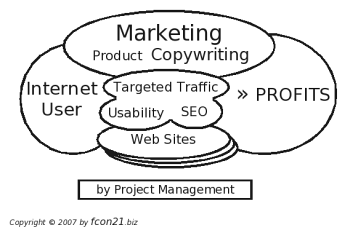 Other disciplines are more or less merely supporting your internet marketing strategy by bringing it to the world. Like, you need a Web site being built, you need a steady stream of interested prospects visiting your site. Good Usability will increase the stickyness of users to your site. Project management will decrease your costs of implementing new services and your time to market giving you a competitive advantage. Our mission is to offer valuable information for “do-it-yourself personas”, consulting services and coaching in exactly those areas of expertise. Sign up to our f-r-e-e Newsletter in the top-right corner of this page as we make some information only available to our subscribers. We can provide quick and easy results or develop a complex solution in reasonable time. Let us know what you need, and we will try to provide you with a competitive offer. Additionally we are offering coaching for those areas listed above. Start reading about those topics on the following pages. The next chapter is about Marketing.